The Duchess of Sussex’s father has stepped up efforts to heal their rift since learning she is pregnant. 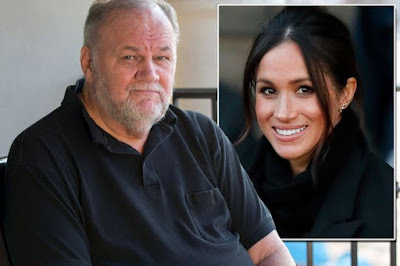 Mexico-based Thomas Markle, 74, is said to be desperate to reconcile with Meghan, 37, before she gives birth so that he can visit his grandchild. Royal sources claim he has spoken of his “rights” and how the tot will be part of his family too, having “Markle blood” as well as “blue blood”. Thomas has made more approaches to Kensington Palace and even appealed to Archbishop of Canterbury Justin Welby, who married Prince Harry and Meghan, for help. And sources say his anger at being cut out of his daughter’s life is such that he may even hire a legal team to force visits through the courts. A source said: “The palace is acutely aware of what problems could lie ahead with Thomas. He strongly believes the baby should be as much a part of his life as they will be Prince Charles’s. “Thomas says the Markle blood will be as much in the child’s veins as the ‘blue blood’ of the royals and he has ‘rights’. He admits mistakes but with Meghan pregnant, he is desperate to heal the rift. He has offered to fly to the UK if he can sit down with Meghan and Harry, 34, when they return from their royal tour of Australia. His push comes as Meghan’s mother, Doria Ragland, may be poised to move from Los Angeles to be nearer during the pregnancy. Thomas learned Meghan was expecting when he heard it on his car radio. Friends of the retired film lighting technician claim he would even like the baby to be called Thomas if Meghan has a boy. His only son is also called Thomas.